That’s decided then, I’m going to vote for pizza in the referendum. I think what we really need are open primaries so we can select the candidates we want to stand, rather than arguing about imperfect systems to choose between candidates than no-one really wants in the first place. I also think there are much more pressing issues than a switch to AV. Who really cares about this other than Lib Dem activists? On the other hand, a lot of people would like us to leave the EU, and both the Tories and the Lib Dems promised a referendum on this in their manifestoes; so where is it? The point i would like to raise however is what is the point of change, the system we have now, seems to reflect the general wishes of the country. It was a shock when the Liberal Democrats didn’t win more seats but unfortunately the mood of the Nation seemed to think it was right for the Conservatives to gain power and they have just about managed that. Also it appears to me that AV promotes tactical voting, in which people vote for something they don;t nesseccarily want to stop a certain party gaining any votes from, example voting BNP over the Conservatives, when course the Conservatives is a better option. Supporters of FPTP often point to the idea that it has a strong tendency towards producing majority governments, rather than hung parliaments, as one of its strengths. Truth is though that there’s nothing inherent in FPTP that leads to such outcomes. What FPTP does is entrench the position of the dominant political parties. For much of British electoral history we’ve had two dominant parties, initially the Tories and the Liberals, latterly the Tories and Labour. However if we’d had three dominant parties, polling around 30% each, FPTP would equally have entrenched perpetual hung parliaments. On the broader point of electoral reform, we need to consider what we want parliament to be. Do we want a parliament of representatives or a representative parliament? Both FPTP and AV produce the former, but not the latter. Given the subjugation of individual MPs to the party system, the idea of a parliament of individuals elected to primarily represent the interests of their constituents has been lost, so I feel parliament should instead reflect where broader political opinion lies, as manifested in the strength of individual parties at the ballot box. That’s why I favour true proportional representation via STV, but sadly nothing approaching that is on offer. @Daniel I think you are exactly wrong re tactical voting. With FPTP, your preference may be for a candidate with little perceived chance of beating the front runner, who maybe you really don’t want to win; so you vote for the second placed candidate instead. Tactical. With AV you simply list candidates in your order of preference, no thinking about tactics is needed. One element on which I’m unclear. At the end of the first round of AV we eliminate pepperoni, meaning that in the next round 11 votes are eliminated from the pool entirely. If we left it that way the decision would be made off the back of just 4 votes – not a representative sample by any means. However, in the results above the second round totals are Meat Feast 7 and Margherita 8, implying that those 11 disappeared votes have been redistributed among the remaining candidates. If this is the case, did you do this arbitrarily (well, you know what I mean, arbitrarily so that the numbers suited the point you were making in this post as you mentioned above)? Unless we were to hold separate rounds of voting e.g. I don’t see how we can know where those 11 votes for the now disappeared pepperoni should go. 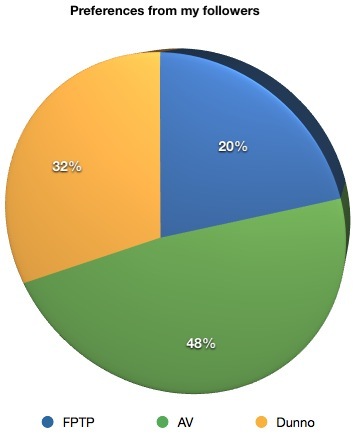 If you look at the raw data, four people chose pepperoni as a first choice. 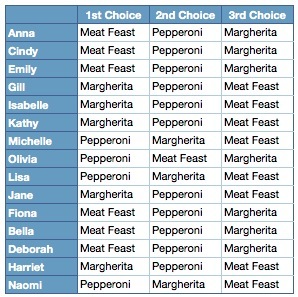 Three of them chose margherita as a second choice an one chose meat feast as a second choice. Therefore after the first round elimination, 3 votes are added to Margherita and 1 vote is added to Meat Feast. I quite strongly disagree with the assertion that the Borda system is fairer than either of the two on offer. There’s nothing inherent in the Borda system that would mean it will always produce a winner who would win in a run off against any other candidate and, in fact, it’s the one system in which some of the lies that are being presented about AV would actually be true. You mentioned that you had rigged the numbers in your example to support your illustration, and in it you show the candidate who was coming last on first preferences going on to win. That’s not the full extent of it though: under the Borda system it would actually be possible for a candidate to win who was nobody’s first choice. Specifying a second preference actually harms your chances of getting your first choice elected! The Borda system is also dependent on an assumption that you can in some way put a numerical value on people’s level of support for candidates, something which is clearly false. My commitment to the candidate I vote for is entirely subjective, and it is not the job of an electoral system to try and measure it in that way. The fact that I prefer one candidate over another doesn’t mean that I prefer them two points more. From what you’re saying, it sounds like you much prefer something like the Schulze method, but I suspect that’s a level of complexity the electorate at large might not be quite ready for! I think “rigged” may be a bit strong. I intentionally used a set of results that would help illustrate the differences between the three systems. In the Borda Count the voter just ranks the candidates in the order they prefer, the system then assigns points. The voters aren’t being asked to score them out of 3 or anything. I don’t by any means think it is perfect but I think the other two throw away information that the Borda Count uses. I also don’t think it is a big problem that it can select a winner who was no one’s first choice. Suppose there are 10 Grand Prix drivers, 9 finish the season with 1 win each and no other finishes. The 10th gets 9 second places and no wins. It wouldn’t be unreasonable in those circumstances to award the championship to the driver with 9 second places. You do make a very well reasoned argument though and I don’t think either of us is right or wrong. We just see things a little differently. Oh, and I had a look at Schulze. Yep – too complicated. A lot of people clearly do find the idea that the idea of a winner who’s no one’s first choice a problem, as it’s falsely being put about as a reason to vote against AV. I don’t really think voting is like a Grand Prix. We’re not trying to find some mythical objective best candidate. We just want to find the preferred choice of most people. It’s hard to see someone as the preferred choice of the majority, when everyone would have chosen another above them. The real question though is, knowing specifying a second preference could harm the chances of my first choice getting elected, why would I do it? It’ll be better for my first choice if I vote only for them. If I want to keep another candidate out it’ll be better for me to vote tactically and first preference the person with the best chance of beating them, harming my first choice still further. AV avoids all of those issues, being not just fairer than the present system, but also practical. But, you know, thanks for at least posting something that tries to look honestly at the issue. As you say, better than a lot of people are doing! I didn’t mean to choose a set of results which showed only strengths of the Borda Count and I’m not really sure I did. The set of results was chosen simply to illustrate that different methods could lead to different results with a perfectly reasonable set of data. Borda Count chooses Pepperoni. It’s up to the reader to decide whether they think Pepperoni is the best choice given the whole set of preferences. Looking at the summarised data alone I couldn’t really say which one was the fairest victor. I like Borda Count better but I don’t think that the data in my table says that one is any better than the other – just meant to help show the differences. I think Borda Count assumes that everyone must rank all candidates rather than penalising people who do or don’t put second or third choices. While that in itself causes problems, I suppose it’s all a case of weighing up the problems with that system vs the problems with any of the others. I agree that it’s more complicated than FPTP, but it’s not that different complexity-wise from the other systems we’re describing. I agree that system is definitely worth a look when there are 4 different candidates as in the example on the link but on the ballot paper I had last year there were 10 candidates. That would mean 45 individual answers required from each voter! I think although it could be argued as more fair than FPTP it might not be practical. Remember the queues of people who didn’t get to vote using FPTP last year? Given the number of answers each voter would need to give it would probably increase voting time significantly and would therefore require many more polling stations and voting staff in order to get through all of the voters. Thanks for providing an alternative suggestion though! > That would mean 45 individual answers required from each voter! The example that I’ve shared was specifically tailored to small candidate sets and non-balloted scenarios (a friend wanted something other than FPTP for book club choices). Your Zombie vote is brilliant! I do see a problem with applying this to a general election though. Suppose I were a Labour voter. I would vote Labour 5*. I would vote everyone else 0*. Although in reality I would probably be better off with a Conservative government than a BNP government, knowing that the Conservatives were more of a threat to my first choice I would unfairly mark them down. If you could prevent people from abusing the system then I think this could be the fairest one but it is so open to being abused…. > I do see a problem with applying this to a general election though. Suppose I were a Labour voter. I would vote Labour 5*. I would vote everyone else 0*. Note that your ballot scenario is no different than Labour 1*, others 0*. Also no different from Labour 5*, others 4*. All it’s inferring is the pairwise comparisons between your rankings (that is to say, we’re not using the magnitude, just the ordering). Setting it up as a ratings ballot is only for ease of use as people do 5-star ratings all the time (restaurants, movies, etc). See http://imgur.com/9wkri for another conversion example. My scenario of Labour 5* everyone else 0* not being any different to Labour 1* everyone else 0* was my point. If people decide to vote tactically then this system is no different to FPTP. > My scenario of Labour 5* everyone else 0* not being any different to Labour 1* everyone else 0* was my point. If people decide to vote tactically then this system is no different to FPTP. Ah, I see what you’re aiming at there. Labour:5 Conservative:0 BNP:0 generates Labour>Conservative, Labour>BNP. Labour:5 Conservative:3 BNP:0 generates Labour>Conservative, Labour>BNP, but also a Conservative>BNP. Your preferences for Labour over the other two parties are maintained. I’ve just been reading all around the voting system pages on Wikipedia again and, I have to say, I think later-no-harm is a much more important criteria than the site gives it credit for. When I stood in an AV election in my students’ union a few years ago, one of the most common questions I got about the voting system was “does putting a second choice harm the chances of my first?” I’m really surprised it’s not come up more in the discussion of this referendum. Unless you can somehow obfuscate the fact, I can’t see many people deliberately sabotaging the chances of their first choice being elected. I think FPTP’s failing of the Condorcet loser criterion is probably its greatest weakness. The principle of looking for a Condorcet winner seems like a good one, but until there’s a system that does it whilst retaining later-no-harm, I think you’re going to struggle to get people to vote honestly. Nice videos though Brad. I wish we had some that clear and simple that linked to information about the AV referendum. > I think FPTP’s failing of the Condorcet loser criterion is probably its greatest weakness. The principle of looking for a Condorcet winner seems like a good one, but until there’s a system that does it whilst retaining later-no-harm, I think you’re going to struggle to get people to vote honestly. The downside is that the Condorcet criterion is incompatible with later-no-harm (http://en.wikipedia.org/wiki/Later-no-harm_criterion). A rough proof of this is to note that Condorcet methods need to inspect all possible preferences. Later-no-harm methods need to ignore preferences until necessary. So yeah, we can’t have both. I think we’re mostly on the same page, though we weigh these criterion differently. A while back I made a tool that lets you sort criterion by priority, then it tells you what voting methods meet your ordering: http://sleuth.cognitivesandbox.com/ . I didn’t know about later-no-harm at the time, but it wouldn’t be too difficult to add in. Makes me wonder under what conditions later-no-harm is objectively more important and likewise with the Condorcet criterion. How do we take this beyond “I think this criterion is more important” to a more reasoned “This criterion is of higher priority when…”. Ah I see, so the first round votes are ADDED TO the second round votes if no one wins outright in the first round. For some reason that’s never clicked before. Of course fans of proportional representation would ask why they couldn’t all just order enough of each pizza that everyone gets a share of what they like best. What do the vegetarians do in the parliaments where Meat Feast and Pepperoni win? They go hungry. I think I’m overstretching your metaphor. Yep – sorry if I didn’t explain it clearly before! if i had the choice, i wouldn’t rank conservative or UKIP. but if lots of conservative voters had UKIP as a second choice and i hadn’t put conservative as my second choice would that advantage UKIP? but then if i have to rank all of them then i my find one of my (forced) choices electing someone i don’t want. I agree that ranking doesn’t say anything about the strength of the preference but I don’t think any system on here is perfect. I just think FPTP throws away a great deal of useful information which in using a ranking system the others try to take into account. I don’t think some people ranking more choices than others is a problem. If there’s only one you like and you dislike all other equally then just vote for one – as soon as your choice is eliminated you don’t give a toss who wins anyway. If you dislike Conservatives but dislike UKIP more then rank them in that order. Your conservative preference would only be taken into account if the people you ranked above them were eliminated. I agree AV is is not the best but it is more democratic and ‘Hobbsean’ because it allows more people more choice…Lovers of FPTP remain enfranchised as they retain their option to vote just for one candidate and reject all others, while the rest of us who think we should have options are also catered for and those who reject the whole thing can still turn their back on their right to vote and stay at home.